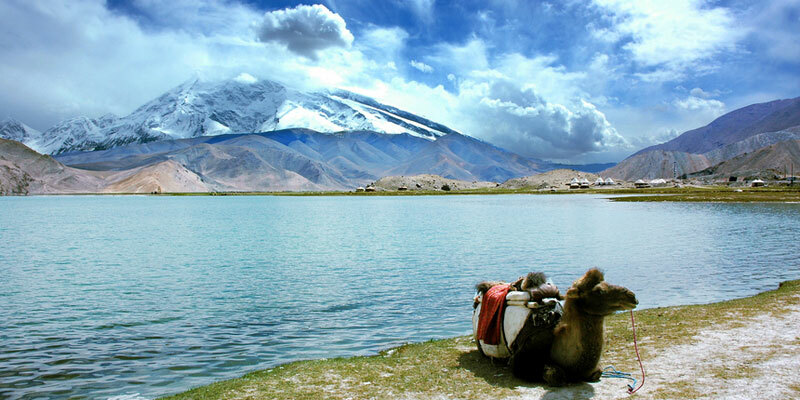 Explore the most remote city from any sea in the world — Urumqi. Wander around the peculiar ancient city of Jiaohe, which was built by digging down instead of building up from the ground. Unveil the secrets of an ancient underground irrigation system — the Karez Well System. 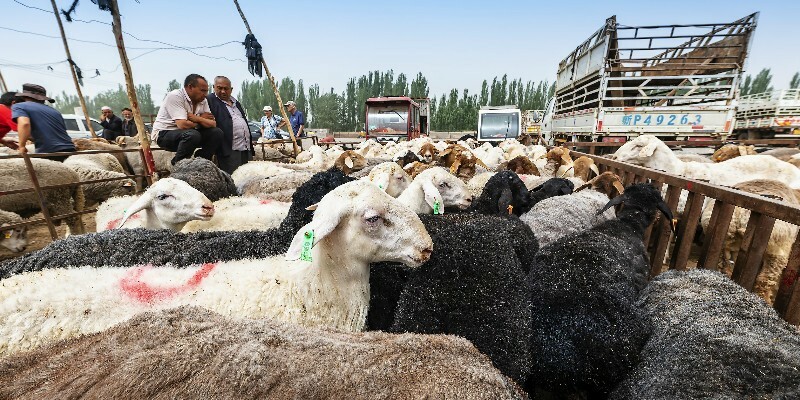 Experience a bazaar that has existed for centuries on the Silk Road — the Kashgar Livestock Market. Enjoy afternoon tea with some locals in an ancient Uyghur teahouse. As China’s largest province and the western end of the Silk Road in China, Xinjiang is the homeland of enthusiastic Uyghurs and several other minorities. Xinjiang offers fascinating music, joyful dance, sweet fruits, and a diverse mix of cultures for you to discover and enjoy. 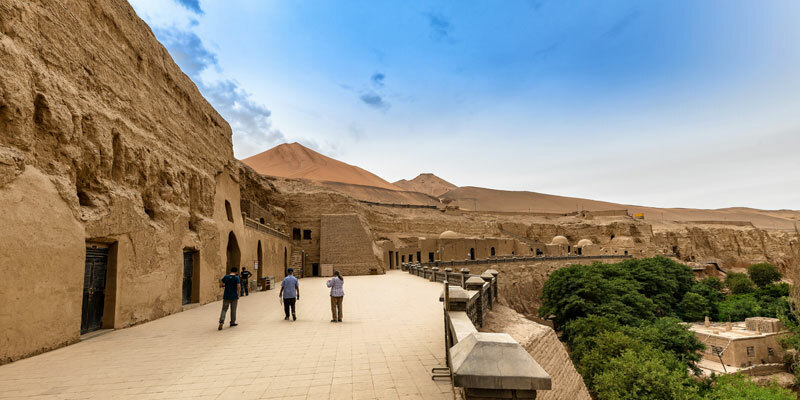 In this tour, you will have the opportunity to enjoy the marvelous landscape, learn about the Silk Road’s history, and interact with the locals. When you land in Urumqi, you will be as far from the sea as you can be. Your private tour guide will be waiting for you in the arrivals area and will be ready to transfer you to your hotel. 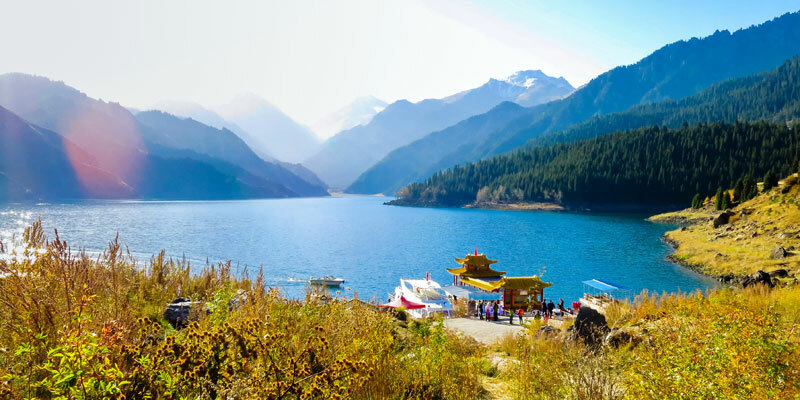 After breakfast, visit Heavenly Lake at the Tianshan Mountains via a boat tour. The mountain lake lies at 1,980 meters above sea level and features picturesque scenery that includes snowcapped peaks. It is very pleasurable to take a boat trip on Heavenly Lake. See the magical colors reflected on the surface of the lake and listen to many beautiful myths and legends. After your boat trip, head for Urumqi and visit Xinjiang Uyghur Autonomous Region Museum. It is based on Uyghur and Russian styles, and houses a collection of over 1,000 pieces of precious relics dating from four to five thousand years ago until modern times. In the morning, you will be driven to Turpan where you can start to explore the cultural relics along the Silk Road. Turpan, as one of the oases of the ancient Silk Road, has preserved its rich landscape and cultural inheritance. First, you will visit the ruins of the ancient city of Jiaohe. This city was built by digging down instead of building up from the ground. After lunch, you will venture underground to explore the Karez Well System and experience the wisdom behind this ancient irrigation system. Then, you will be driven to the city of Turpan where you will visit Turpan Museum. In the document exhibition hall, you will find numerous old documents in many different languages, and this is evidence of the cultural exchange that took place along the ancient Silk Road. Visit the Emin Minaret in the morning — you will be fascinated by the beautiful shadow cast across the wall in the morning sunlight. Older than the Mogao Caves, the Bezeklik Thousand Buddha Caves also have marvelous murals but, unfortunately, most of the murals were damaged either by people or from natural causes. You can still peek at the fine murals from the broken wall. After lunch, you will be driven back to Urumqi to catch your flight to Kashgar. 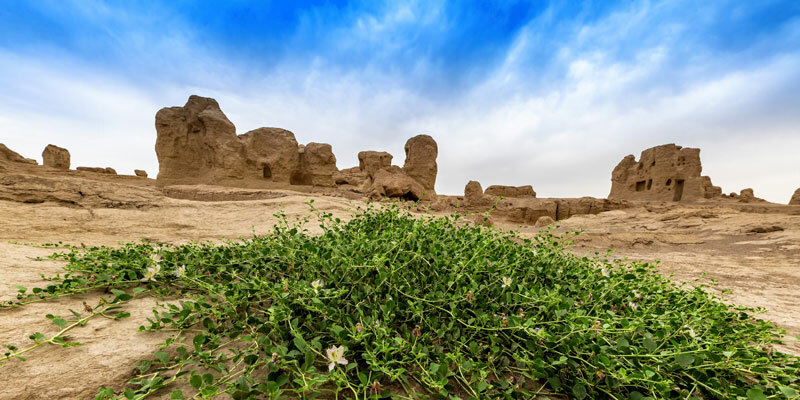 Spend the whole morning in the captivating Kashgar Old City where you can see green lianas climbing on mud buildings and children chasing each other. Later, go to the Kashgar Grand Bazaar, which is famous throughout Asia. This ancient market attracts locals and merchants from all over Xinjiang and nearby countries, such as Pakistan and Kyrgyzstan. If you go there on a Sunday, you will have the opportunity to see the livestock market, which is where people take their livestock for trade and shearing. You will hear people bargaining and different animal noises, and you will see sheep trying to escape and money passing from hand to hand. Afterward, visit a Uyghur family’s home and learn how to cook a local meal. Walk from the old city to the Handicrafts Street. Go into the shops, touch the semi-finished handicrafts, and test the timbre of exotic musical instruments. Have a break at the ancient teahouse, which has a history of over 100 years. Many locals gather there to chat, enjoy a tea break, play music, and to dance, spending a whole afternoon there. See one of the best-kept secrets in China: Karakuli Lake, a sparkling glacial lake. During the 3-hour drive, you may want to ask the driver to stop so that you can take photos as the scenery is breathtaking. The scenery and lake will draw out your inner photographer, so remember to take an extra memory card with you. Besides the breathtaking views, another refreshing experience is the uncanny silence and pure air, which is a beautiful contrast to the hustle and bustle of Kashgar. 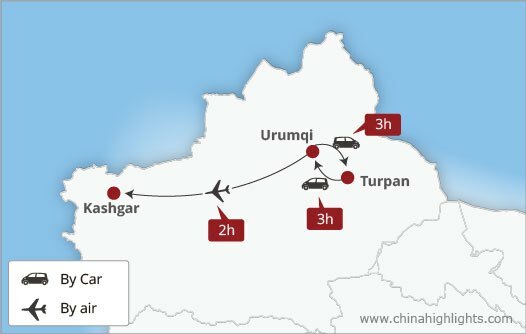 Your guide and driver will take you to Kashgar Airport to catch a flight, and will make sure that your check-in goes smoothly. 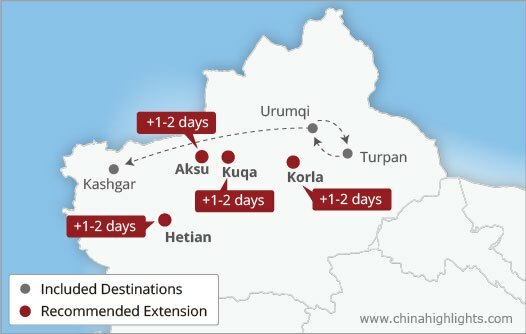 Kashgar has daily flights to main cities in China, such as Beijing, Shanghai, Xi’an, and Guangzhou, where you can have access to international flights. Please tell us your next destination and we will offer you a suitable suggestion. In remote cities, such as Kashgar and Turpan, star-rated hotels might not be as good as the same standard of hotels in big cities due to local situations. To provide you with a comfortable experience, we have selected the best possible hotels for you.